Lake Nakuru’s compactness and varied landscapes are instantly likeable, and it’s ideal for first-time safari-goers and families (even with small children). On my last visit, waterbuck, impala, buffalo and Rothschild's giraffe were right on the roadside, and I’ve often spotted leopard lounging (unusually) during daylight in the giant yellowwood acacia, and in the southern flat area, lions stretching out in the sun and the odd rhino taking a stroll on the lakeshore. The lake itself though has recently changed considerably; once dominantly a soda lake that famously attracted thousands of flamingos, heavy rains and floods in the Rift Valley since 2012 have swelled it to such an extent that some of the game-driving tracks and campsites have been submerged (even Main Gate has moved to higher ground). But while Lake Nakuru’s environmental character has altered a little (and the flamingos have largely flocked elsewhere), thanks to more fresh water, animal numbers are flourishing and are easily-seen. 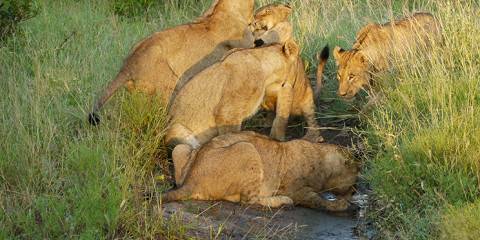 It certainly won’t be wild enough for some, but is easy to navigate and a game-viewing circuit only takes about three hours – even by taxi or on a game drive booked at the gate. My top tip is to take a picnic and admire the new shapes and colours of the lake from the lookout at Baboon Cliffs. If you expect to see the flocks of flamingos, which are Lake Nakuru’s claim to fame, you’ll likely end up disappointed. Due to rising water levels, the flamingos have moved to other Rift Valley lakes and this might well be a permanent situation. Lake Nakuru is still a special place. Due to lower salinity levels of the water, the birdlife is better than ever, with big flocks of pelicans stealing the show. Watching these comical birds taking off and landing on the water never fails to entertain me. The yellow fever tree forest tends to be shrouded in mist rising from the lake in the early morning and this is a magical setting for a game drive. Elephants are absent, but black and white rhino and the rare Rothschild’s giraffe have been re-introduced and all but the black rhinos are easily seen. Contrary to most parks in East Africa, Lake Nakuru, which is remarkably close to Nakuru town, is totally fenced and the town is visible from many places within the park. So, this isn’t much of a wilderness experience. This smallish park, one of the few in Kenya that’s fenced in its entirety, may be a little lacking in wilderness character, but it has traditionally been included on a high proportion of safari itinerary for two main reasons: flamingos and rhinos. Historically, the more important of these attractions was the million-strong aggregations of flamingo that once frequented the shallows of Lake Nakuru. However, this phenomenon has always been rather unpredictable, and since 2012 the flamingos have been absent altogether due to a change in the water levels. 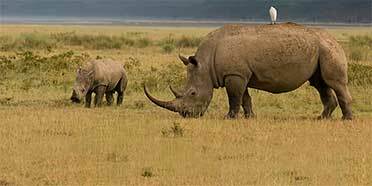 Fortunately, Nakuru still supports exceptionally high densities of both species of rhino, which have been introduced here because it is relatively easy to monitor for poachers. The larger and more peaceable white rhino is abundant on the grassy lake floodplain, where it is more easily seen than in any other East African national park. The smaller, crankier and more secretive black rhino tends to stick to the thick acacia woodland south of the lake, where it is quite common, but often challenging to locate. 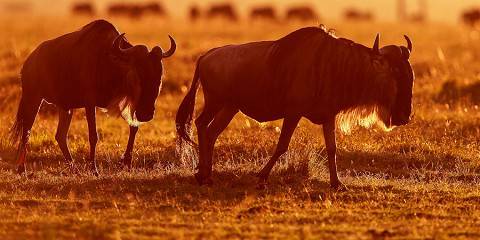 Other wildlife likely to be seen in Lake Nakuru National Park includes the localised Rothschild’s giraffe, plentiful buffalo and waterbuck, and small numbers of lion and leopard. And even without flamingos, this small national park – listed as a Ramsar wetland and Important Bird Area – supports a remarkably diverse and exciting avifauna, with impressive flocks of great white pelican the stars of a checklist that extends to 450 species. Along the Rift Valley north of Nairobi are strung a necklace of small lakes. Shallow pans, mainly fed by rainwater pouring off the escarpment, most of them are brackish soda lakes thanks to the intense volcanic activity in the area. The centerpiece of the pendant is the glorious Lake Nakuru National Park, which is about 140km north-west of Nairobi, along excellent roads. A bonus en route is one of the best Rift Valley viewpoints in Africa. Over the years that I’ve been visiting, Nakuru town has jumped from a sleepy market town to a fair-sized city and the park has become one of the most popular in Kenya, not just because of its ultra-convenient location, but because it truly is magical. It isn’t that big and it doesn’t have elephants (which I do mind) or crocodiles (which I don’t) but other than that, it is pure, unadulterated magic. Expect to pay for the privilege – along with other popular parks, the fees are extremely high. Even though it stands on the floor of the Rift Valley, the park is still 1754m (5,756 ft) above sea level. It covers 188 sq kms (73 sq miles) around about half the lakeshore and stretching across the savannah behind. The name means ‘Dusty Place’ in Maasai, a name which is something of a misnomer in recent years as heavy rains since 2012 have filled the lake, obliterating its once wide open shore and, crucially, lessening the salinity of the brackish soda water. Nevertheless the now lush park houses a remarkably varied eco-system from open savannah to a dramatic euphorbia candelabra forest and its many animals are thriving and easy to view. This was Kenya’s first rhino sanctuary, with both white and black rhino relatively easily seen, and there are also healthy leopard populations and rare Rothschild giraffes. In all, there are 56 species of mammal, but for once the birds take pride of place. In all, there are around 450 species from little brown jobs to glossy starlings, buzzards and many hundreds of pelicans. What the lake was always most famous for, of course, was the flamingos, thousands upon thousands of them. If I were keeping a list of my top 20 magic moments, one of them would definitely be standing on the shoreline of Lake Nakuru in the late afternoon light watching the flamingos grazing on the blue-green plankton that gives them their rich salmon-pink plumage (weird but true), all perched on one leg clacking their beaks eerily and occasionally spooked as one into pearly pink flight. Sadly, with the rising water, most have moved to other lakes along the Rift and it remains to be seen whether they will ever return. However the pelicans are doing their best as stand-ins and this little park is still magical for those in need of a quick and easily accessible wildlife fix. Lake Nakuru is world famous for its bird spectacle: namely the tens of thousands – occasionally up to one million – greater and lesser flamingos that turn the shores pink, plus a rich selection of other birds that share the water’s edge and surrounding savanna. Less well known is the impressive selection of mammal species, including big cats, buffalo, giraffe and both species of rhino, many of which have been reintroduced into a fenced area around the lake. The reserve’s relatively small size and its location in a populous region, just 160km from Nairobi, has necessitated the construction of these fences. 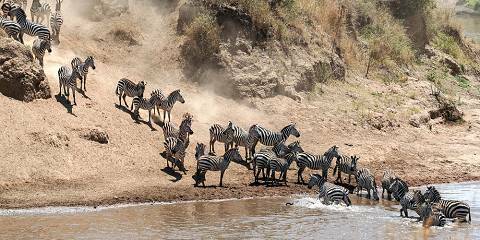 This somewhat detracts from its wilderness vibe, and perhaps explains why many tour itineraries visit the lake on just a day-trip en route to Masai Mara or other wilder horizons. The park definitely rewards greater exploration, however, and there are campsites and lodges for those who want to do so. During my day’s visit, I enjoyed an excellent leopard encounter – something for which the park is well known – and was also impressed by the high numbers of waterbuck, reedbuck and other antelope. You may also spot one of the park’s many large pythons. Either way, the flamingoes – part of a transient population that migrate up and down East Africa’s Rift Valley lakes – should not be missed. Lake Nakuru National Park is one of Kenya’s big ticket parks and, on the right day, one of the best places in East Africa to see flamingos, which sometimes occur in mind boggling numbers – well over a million isn’t unheard of. As well as blushing pink birds the park is a hot spot for rhinos, both black and white. Leopards are also seen with frequency and there are large numbers of pelicans, warthogs, waterbuck, buffalo and zebra. Throw in the namesake beautiful lake which is best appreciated from the top of the baboon cliffs at the park’s western edge, easy access from Nakuru town which abuts the park, a well-maintained road network and what emerges is one of the best family-friendly parks in the country. But, what the park gains in user friendliness it loses in wilderness appeal. Fenced in its entirety, Nakuru National Park is home to so many rhinos (which have largely been brought in from less well-protected parks) simply because it’s not a remote and wild park and therefore they can be easily protected here. And, despite the density of wildlife here, this can make some people a little snooty about Nakuru. Before I first visited the park I probably fell into that category myself but when, eventually, I did get around to visiting and I first saw the lake tinged with the pink of flamingos, my opinion quickly changed. Sure, I’d seen flamingos before but never quite in the numbers that were present here and what made it better is that as I peered at them through binoculars my view was constantly being obscured by other animals: Rothschilds giraffes, rhinos and others, ambling through the foreground. However, flamingos, being fussy birds, are reliant on just exactly the right depth of water in order to flourish. In recent years (from 2014) heavy rains through much of Kenya’s Rift Valley region have raised lake waters considerably and this means that right now there are far fewer flamingos present than five or six years ago. If flamingos are your big reason to visit Nakuru, then it would be wise to seek local advice before heading into the park. Overlooking the current flamingo-less flamingo lake then, to summarise I would say that if you want a real back-of-beyond safari then Nakuru probably won’t do it for you, but if you were travelling here with children, or people with only a limited interest in wildlife, then Nakuru, which can be enjoyed over the course of just a couple of hours, before heading back into town, should be high on your list of parks to visit. Nakuru National Park is a short drive from Nakuru town, making it one of the most visited parks in Kenya. Whilst it doesn't rate highly as a true wilderness experience, that’s not to say that a visit here isn’t worthwhile. White rhinos are common here, and there are also large numbers of waterbuck, buffalo, impala, warthog and the odd lion. This is also one of the best places in the country to see leopards and they can attract quite a crowd. On my last visit here my guide pointed out a leopard in the trees; within minutes it was surrounded by a gaggle of jeeps, and tourists’ cameras flashing brightly against the dusk. The park is most famous for its flamingoes, however. There were once over two million but numbers have dwindled due to fluctuating water levels, pollution and drought, although there are still enough to create quite a spectacle. My overriding memory of the park is of a late afternoon at the southern end, the lake tinged pink with thousands of flamingoes, and rhinos quietly grazing in the foreground. Lake Nakuru ranks among Kenya’s premier parks, with fabulous wildlife-watching within a manageably compact space. During one recent short day’s safari, I saw black and white rhino (the park is home to almost 150 rhinos), leopard, lion (including tree-climbing lions) and buffalo, not to mention the highly endangered Rothschild’s giraffe (no patterning below the knees), black-and-white-colobus monkeys and abundant birdlife. Some years, vast flocks of pelicans and greater and lesser flamingos turn the lake pink. Rhinos are also often seen sloughing around in the mud close to the lakeshore. The thicker forest off the lake’s northeastern corner is where I’ve always had the most luck with leopards, while the best overall views are from Baboon Cliff. Away in the park’s far southwest, Makalia Falls is an impressive cascade of water and the quietest corner of the park. Elsewhere, my only complaint is that the sounds of neighbouring Nakuru city are sometimes audible within the park. It’s now many years since the gigantic flocks of flamingoes which used to grace Lake Nakuru began to diminish in number, thanks to a change in the chemical makeup of the water. Even so, the image of that shimmering vision in pink remains a Kenyan icon, and it’s rare for the flocks to be absent altogether. When I visited, there was a healthy number of lesser flamingoes gracing the water, along with crowds of pelicans. There’s more to the park than the lake – acacia woodland surrounds the water, and it’s easy to drive around looking for rhinos, giraffes and baboons. I saw a good number of waterbuck at unusually close range – the park is an excellent place to watch them as vehicles don’t seem to disturb them unduly. Just as well, as there are always plenty of vehicles here – the park is right next to the busy town of Nakuru, and very accessible. Some parks just make you feel good when you are on safari – in Lake Nakuru NP, the animals almost look as if they’re smiling… It’s no wonder the park is so popular, with its dramatic Rift Valley views, rich wildlife population (four of the Big 5 – no elephants) and variety of birdlife, including great flocks of pelicans. The habitat here is really varied (woodland, savannah, mountains, the lakeshore) which makes cruising around on a safari all the more interesting. And even better is that you have a great chance of spotting rhino – or so I’m told, I never saw any. I was lucky enough to see the famed tree-climbing lions though, one with its head poking out the top of a squat acacia and the other crouched on a lower branch. Who says lions don’t climb trees? Here they do! The flamingos used to be a big drawcard of this park – unfortunately most departed for richer feeding grounds a few years ago, however the lakeshore is still a rich repository of birdlife, and birders have hundreds of different species to discover. This is a park I would definitely spend more time in and I recommend a couple of days here at least. Once upon a time, people flocked to Nakuru to spot the flamingos that flocked here. Sadly, thanks to repeat floods in the Rift Valley, the flamingos no longer come, but happily the visitors do. The park is home to four of the Big Five (elephants are absent) as well as hippos, a wealth of antelope and the usual zebra and giraffe. Spotting the animals can be challenging and my personal wildlife-watching experience here was largely underwhelming. Scenically though, this park sitting in the Rift Valley is arresting, particularly the vistas from Baboon Cliff Viewpoint, which conjure up scenes from The Lion King. I know it’s a bit cheesy, but I just love flamingoes. I can swamp my eyes with their pink gorgeousness for hours on end and never get tired of them. That’s why I love popping into Lake Nakuru National Park, which is often (but not always) the feeding ground of thousands of the leggy pink beauties and their accompanying pelican flocks. The rest of the park is nice, but not terribly extensive, and due to its small size game sightings can be thin on the ground. The park’s advantages include its proximity to Nairobi, making it easy to visit for a day trip, and its introduced population of white rhino. If you don’t have long in Kenya (or are a flamingo nutter like me) Nakuru is a nice, easy and scenic place to spend a day or just a couple of hours.